Fiocchi ammunition is manufactured by Fiocchi Munizioni, a privately owned company headquartered in Lecco, Italy. Founded in 1876 by Giulio Fiocchi, Fiocchi has become a world leader in shotgun, rifle, handgun, and rimfire munitions production. Since 1986, the company has manufactured most of the ammunition for its American customer base at their state-of-the-art facility in Ozark, Missouri. 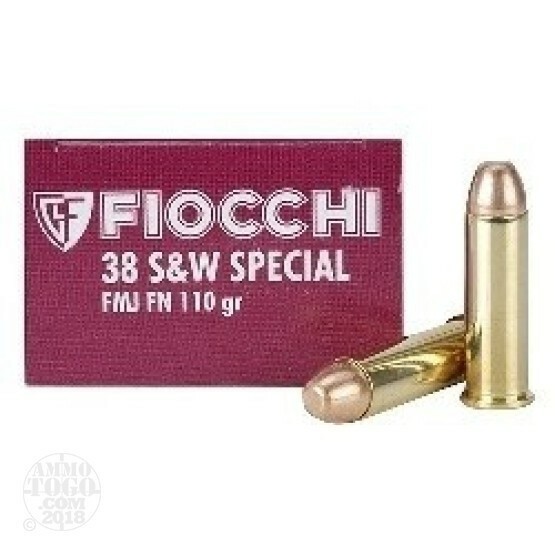 This package contains 50 rounds of Fiocchi .38 Special ammunition. Each cartridge is loaded with a 110 grain full metal jacket flat nose projectile. Producing no terminal expansion, these loads are best suited for target shooting and tactical practice. This ammunition is factory fresh, non-corrosive, boxer primed, and brass cased. Quality components are measured and matched to provide reliable, consistent functioning with match-grade accuracy. Each round produces a consistent muzzle velocity of 10 80 feet per second and 284 foot pounds of muzzle energy. This is +P overpressure ammunition and should only be used in firearms designed to handle higher pressure levels.